As of 1 July 2015 Medicare Local will become yet another casualty of Abbott’s horror budget, with all providers scheduled to close their doors. Today it was a privilege to visit my Medicare Local in Ashfield, which provides crucial services to those who need it the most. Whether it’s aiming to close the gap, addressing mental health, helping to prevent or manage chronic disease, supporting practices, educating health professionals or raising health awareness more generally, these are the Medicare Local programs that make a real difference in the Inner West. 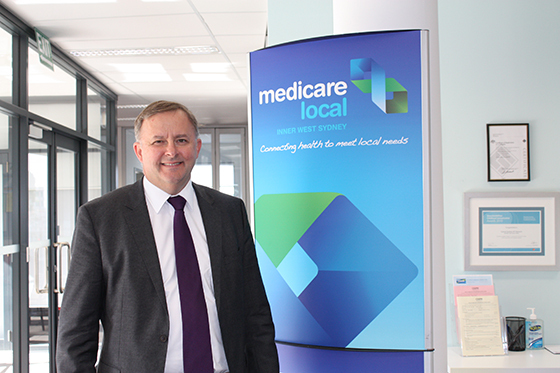 Before the election, the Coalition promised no Medicare Local would close. This is another broken promise and another example that Abbott just doesn’t like the public. This is despite the recent Medicare Locals Review Report recognising the great work these organisations do when it comes to primary care. The Review confirms that Labor’s reforms to primary health care are the right ones, and that Medicare Locals, established to keep people well and out of hospital, are what the health system needs. Despite this Review, and in a move that will simply waste tax-payers’ dollars, Abbott will abolish our Medicare Locals and establish ‘Primary Health Networks’. We need to know what this means for the Inner West and we need the Abbott Government to confirm that no jobs and services will be lost. Since the Coalition’s budget speech last week, my electorate office in Marrickville has been inundated with calls from concerned residents, who are particularly fearful of the implications it will have on their health.